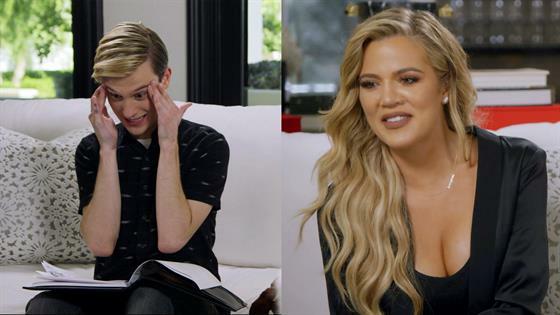 Tyler Henry sure has a unique gift of keeping up with the Kardashians. Earlier this week, pop culture fans were shocked when they read the rumors surrounding Tristan Thompson and Jordyn Woods. And while fans are still trying to wrap their heads around the headlines and drama, some have been reminded of a special message Tyler delivered to Khloe Kardashian and Kylie Jenner. "There's a situation where someone tries to get with one sister," Tyler shared with the Keeping Up With the Kardashians stars as he let out an anxious laugh. "Someone tries to get with one sister and then tries to get with the other. Umm, what is happening? Does that make any sense?" While the sisters stay mum about how they understand the message, Tyler is just happy they can comprehend what he's trying to say. "I don't like that situation," he shared. "As long as it makes sense to you. I'm blushing." But before you make your assumptions about who Tyler could be talking about, there's more. "There's a situation with an individual from the past that you have been romantically involved with and I basically see this individual kind of going in and out and to me, that generally indicates that this person is kind of in our lives and kind of out of our lives and kind of in our lives and kind of out of our lives," he shared. "The feeling is basically that we want to really set healthy boundaries and say nope, nope. You can't really dip your toes in and leave when you want. And can't really commit." While no names were mentioned when the episode first aired in June 2017, fans are being quick to speculate as to how it relates to Khloe and Kylie's current situation today. Earlier this week, E! News confirmed that Khloe and Tristan have broken up. As for the reports that Tristan cheated on Khloe with Kylie's BFF Jordyn, they're just as shocked as you are. "She is angry more than she is sad. And she's shocked Jordyn would do this. Of all the guys in the world, she can't fathom why Jordyn would make a decision like this," a source explained. "Khloe is reliving the worst kind of betrayal and pain all over again."